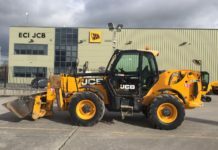 The side mounted JCB engine combined with JCB axles and transmission, ensure reliable drive train performance from well proven components. 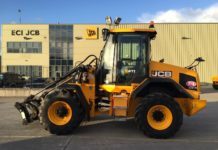 Forward reach of 12.5 metres, lift capacity 4.0 tonnes, maximum lift height of 16.7 metres and lift capacity of 0.6 tonnes at full reach, all improve productive capability. 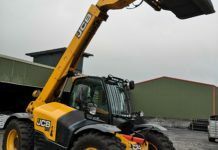 The JCB 540-170 is the first JCB Loadall to feature a four-stage boom. This is how the machine achieves such a massive lift height without compromising manoeuvrability. 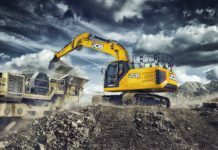 For additional capacity the 540-170 comes with heavy-duty stabilisers and chassis levelling as standard. 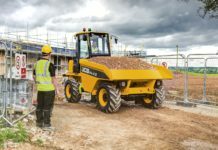 Stabilisers ensure safe placement of heavy loads to full height while chassis levelling gives improved load ratings when stabilisers are not used and easier transportation of bulky loads on uneven ground. 74.2kW (100hp) or 93KW (125hp) engine options. All round visibility allowed by low boom line gives the operator greater confidence to move quickly and safely. Audio and visual warnings give rapid driver feedback on engine and transmission status. 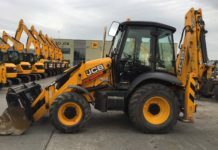 Strong boom construction is a feature of JCB Loadalls. The inner boom material extends forward and wraps downward to form the boom head. This is a critical stress point in digging applications. 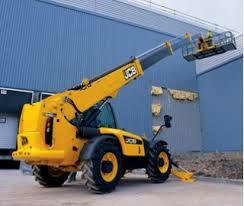 The JCB design spreads the stresses throughout the boom eliminating fatigue and potential failure at the boom nose. Large boom overlap between inner and outer sections ensures no boom distortion and avoids potential failure. 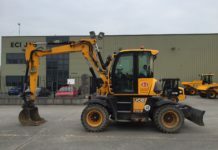 A one-piece welded chassis, with thick steel sections for added rigidity, gives this machine excellent longevity even in the toughest environments. 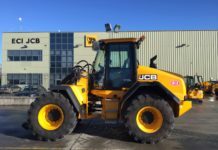 Chassis, boom and carriage are all extensively tested to ensure maximum resistance to fatigue failure. Low friction, long-life, wear pads plus long service intervals of 500 hours for boom lubrication and engine servicing cut costs and ensure reliability. Spacious cab, for greater comfort and minimal fatigue. 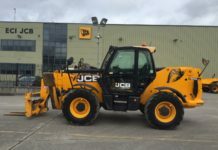 Low instrument line and big roof window ensure excellent forward and upward vision, ensuring that the operator can always clearly see the boom. 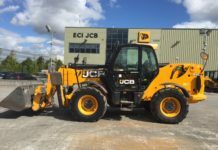 Large glass area and hub mounted fenders mean the operator can always clearly see the direction of the wheels. Cab options include radio housing, roof blind, storage mouldings, power socket and air conditioning.